Today, we’re looking at Banette-GX from SM Celestial Storm, which is a spiritual successor of Banette-ex from EX Legend Maker. You can read the older 2016 review here; seems like the reviews are unfavorable. As for the GX, it is a Stage 1 Psychic Type with 190 HP, weak to Dark, resist Fighting, and a retreat cost of one, it has an ability and two attacks. Shady Move is an ability that moves one damage counter from any Pokemon to another Pokémon in play. Shadow Chant costs P for 30 damage plus 10 more damage for each Supporter card in your discard pile up to 10 Supporters. Tomb Hunt GX costs P and pulls 3 cards from the discard pile into your hand. After reading older reviews, I finally understand why this card is underwhelming. Moving damage counters is great, as it softens damage so that you can secure the KO. Or you can move one damage counter from one of your Pokemon to one of your opponent’s Pokemon, which is like healing 10 damage and doing 10 damage to one of your opponent’s Pokemon. Still, that seems like it does way too little for modern times. Shadow Chant hints at something wonderful, but it also presents a dilemma. Every card in your deck is precious; you want to make use on most of them instead of mindlessly disposing them just to increase damage output. This attack seems like it’s suitable for late game, when most of the cards are being used. When you do get 10 Supporters in the discard, then Shadow Chant becomes a wonderful 130 damage for one Energy, enough to barely 2HKO the game. Tomb Hunt seems like a last minute inclusion for a GX move since the older card has just an ability and an attack but it isn’t bad. Having an attack on a Stage 1 instead of a Stage 2 (looking at you Decidueye-GX) seems to be more efficient. I wouldn’t recommend using this card as it doesn’t seem powerful enough for what it does. I mean, why spend time fiddling with damage counters when you can outright OHKO what’s in front so that you don’t get snowballed out of control? Don’t get me wrong, control decks are creative, but most decks would want what would be called “one-punch man”: land KOs and take prizes quickly. And with Zoroark-GX still being very popular, the Darkness weakness makes Banette-GX not stay for much longer. Banette GX (CES 66) sneaks back into the format through the Celestial Storm expansion set. This 190 HP Stage 1 GX Pokemon has captured the interest of many players because of its ability Shady Move which allows you – once per turn and if Banette is in the active position – to move one damage counter from any one Pokemon to any other Pokemon. So obviously this will probably be from one of your Pokemon to one of your opponent’s Pokemon, and if you switch, retreat, or devolve Banette (or both), much like Greninja Break, you can potentially use this ability multiple times in a turn if you have multiple Banette GX’s in play. Unfortunately, Devolution Spray is no longer Standard legal, so that trick is available in the Expanded universe only. Its main attack, Shadow Chant, is ok, but is capped at 130 damage. Banette would probably benefit from having Sableye from this set on the bench, and with Ultra Balls and Sophocles and other cards, it’s not that hard to get ten Supporters in your discard. I mean, you play pretty much one every turn, so it shouldn’t take that long to max out the damage for this attack. Its GX attack, Tomb Hunt, isn’t awful. Getting any three cards back out of your discard pile and into your hand can definitely be beneficial, especially since Puzzle of Time has been banned. Overall, however, this card is somewhat lacking. From its low HP to its capped damage output to its Darkness weakness (which might now be the WORST weakness to have, although Fire will be a close second after this weekend) to its mediocre GX attack, this card just doesn’t really do a whole lot for me. Maybe if Shady Move allowed you to move two or three damage counters or if you didn’t have to be in the active position to use it or if Shadow Chant weren’t capped, maybe then Banette GX would be better, but right now as it is, this Pokemon is a pass for me. Three of the top 32 decks at worlds, however, ran at least a single copy. Rahul Reddy carried two in his 13th place list, Christopher Schemanske had one in his 15th place list, and Alex Schemanske had one in his 26th place list. A single attachment Pokemon that can easily OHKO Buzzwole (baby or GX) without having to worry about how many energy cards are attached to the opponent’s giant mosquito was very valuable in the prior format. Today, however, considering how much Zoroark is running around, that Darkness weakness really makes you think about whether or not you want to put an easy OHKO 2 prize target in a decklist. As of the time of writing, I’ve played 104 matches in the new Standard format, and 21 of them have been against Zoroark something. It’s kind of hard to justify running a Dark weak Pokemon when you’ll be going up against Zoroark about a fifth of the time. Welcome to a placeholder review, because I’m pressed for time but wanted to make sure I didn’t completely miss any CotD’s this week! If time allows, I’ll replace this with a full review later. For now, let’s just run through Banette-GX as quickly as we can. The good about the card? It is a [P] Type when it is still a useful Weakness to exploit. [F] Resistance gives it a little more cushion against Buzzwole-GX, Marshadow-GX, etc. Its Retreat Cost of [C] is easy to pay or can be totally eliminated with something like Escape Board. Its “Shady Move” Ability only works while Active, but it lets you move a damage counter from any one Pokémon to any other Pokémon, which spans all players; heal some damage while faking a PlusPower or just avoid overkill while setting up for the next KO. “Shadow Chant” only requires [P] to do 30 plus 10 per Supporter in your discard pile, though you can only get a maximum bonus of +100 from that effect e.g. to do more than 130 damage with Shadow Chant you’ll need combos. Depending on the match-up, even 60 for [P] isn’t too bad, and while 130 isn’t scoring OHKO’s against Pokémon-EX/GX without help, its still a great deal. “Tomb Hunt-GX” also only requires [P] to use, and is a once-per-game triple reclamation from your discard pile; any three cards of your choice come back to your hand. The bad part of the card is that it only has 190 HP while being a Stage 1. Neither of these things is awful on its own, but together they make Banette-GX a bit of a risky investment. This is further compounded by [D] Weakness, as Zoroark-GX is still a common play and now it can OHKO a fellow Stage 1 Pokémon-GX with its “Rioutous Beating” attack for just [CC] and a Bench of at least four Pokémon (less with a Choice Band). Still, Banette-GX decks managed three placements in the Top 32, with one as high as 13th place and that’s just for the Masters Age Division; a Banette-GX deck won the Seniors Age Division! That is all pre-rotation, and I’m not seeing much of it in the few results post-rotation, but I think Banette-GX is AT LEAST going to be one of those archetypes that pop up once people stop worrying about it, and it might actually be fairly competitive. I don’t think it can be in the top, however, because Zoroark-GX is just too much of a factor. Banette-GX is a Stage 1 Psychic Pokemon-EX, 190 HP, with a Darkness Weakness, a Fighting Resistance, and a Retreat Cost of 1. Its Shady Move Ability can transfer any damage counter from 1 Pokemon to another, but only one counter can be moved once per turn, and it’s only while Banette-GX is Active. Shadow Chant is a neat 1-for-30 attack that does 10 more damage for each Supporter in your discard pile, but it can’t add more than 100 damage in this manner. And finally, Tomb Hunt GX lets you add back 3 cards in your discard pile back into your hand for 1 Energy. I get why they ultimately put the restriction on Shadow Chant’s damage so that it couldn’t get up past 1-for-130 without some damage boosting from other cards, but I don’t think there are a lot of decks nowadays that run so many Supporters. Don’t get me wrong, a lot of decks run a hefty amount of Supporters in order to go through the deck faster, but I just don’t think even a regular Banette-GX deck would want to throw in so many Supporters just for the sake of powering up Shadow Chant at the cost of some…inconsistency. Just imagine having a hand full of Supporters at any given time, and you get what I mean. 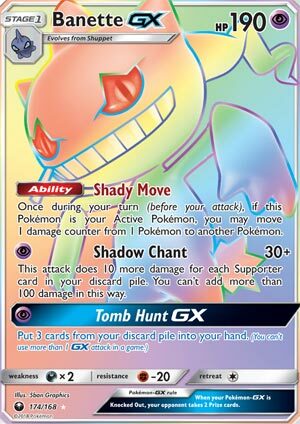 That being said, Banette-GX seems pretty boom-or-bust around Shadow Chant. You can use Shady Move if you want to in order to set-up other cards to take a fall from future Shadow Chants, but at 130 damage a turn before any other boosts, you should be able to 2HKO most things anyway. And Tomb Hunt GX is really more of a resource renewal card, letting you get back anything you want to use again with ease. I think the best strategy around Banette-GX would be something that runs a few disruptive Items as well as Supporters to keep the opponent at bay while you set-up before trouncing them, using Tomb Hunt GX to recycle a few of those disruptions. By comparison to some of the other Pokemon decks out there, Banette-GX feels a bit slow though. Without a means of putting Supporters into the discard pile rapidly such as with Sycamore or Battle Compressor, relying on Shadow Chant may take a lot longer than you’d like, even with Shady Move manipulating a little damage here and there. Throw in for a good partner with Banette-GX though, and I think there’s some potential for a new deck archetype! Will it be anything on the scale of things like Buzzwole-GX? Probably not, but at least it can hit him for weakness – so keep that in mind! Arora Notealus: Banette-GX definitely has a lot of potential within its moveset, but it’s all about playing the long game with him, and most of the time, decks like to cut to the chase. This could mean that Banette-GX will fall behind the main competition, but it’s also got a good Type to go up against one of the biggest decks at the moment. Next Time: The mysterious warrior of the trees returns again!